Charging my phone overnight left me with only 28% battery this morning because I had an old SIM in it. Apparently that pulls more juice than the charger provides. Oops. In fact when I look at the battery usage, it gives that very tip (on Android): use airplane mode in an area with no cell coverage to save battery. Last night my phone informed me of an available update to Android 4.1.2 (Jelly Bean is 4.1.1). Do I really want to upgrade hours before my trip? What if it bricks my phone? OK that’s unlikely. Now the phone is asking me to upgrade every hour or so. Posted on October 18, 2012 Author JTCategories Cambodia, Hong Kong, SingaporeTags techLeave a comment on Tech dilemma: upgrade Android? I finally reformatted/reinstalled Android on my smart phone and it’s working again. Malaysia is still nowhere near a Top 10 favourite country. Yeah, the lack of sunshine definitely isn’t helping my photos or my disposition. Walking around yesterday evening looking for dinner, I could barely be bothered to pull out the camera for anything. 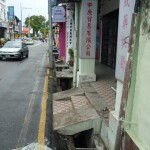 And sidewalks are a disaster, when they exist, uneven with exposed deep runoff (sewer?) concrete ditches. Hawker stall was tiny compared to Singapore. Admittedly, my char kuay teow (flat wide rice noodles with fried egg and seafood) was much tastier here than in Singapore. 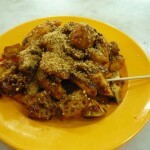 And the rojak penang was good too: cut up fruit & veg in a sweet and spicy peanut sauce (a “salad” of sorts). 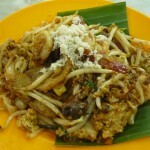 Penang is supposed to have the best food in Malaysia (people fly here primarily to eat). Update on my phone: after googling, this Android-hanging-on-startup problem isn’t uncommon, though the usual fix (clearing the cache) doesn’t work since that seems to hang as well. good thing I decided to take my netbook with me to Penang, Malaysia. I bought a local SIM card from PCCW the first morning. Surprisingly I didn’t need to show ID. Cost was only HK$48/US$6 which included the full HK$48 worth of credit, i.e. the SIM card is effectively free (in comparison, I’ve paid up to US$30 in other countries for a SIM card with almost no credit). This was for the “no IDD” (international direct dial) version, which means I’d have to call through a special number in order to make international calls, which I’m not planning on doing. The IDD version was maybe 50% more expensive. This gives me a local Hong Kong phone number (good for 180 days or as long as I keep recharging the account), as well as data on my phone at a not-cheap rate of HK$3/U$0.39 per MB. The data was easy to set up on my phone – pretty much just two entries for the APN. For another HK$48/US$6 I bought a wi-fi plan online from PCCW – that’s the one month one device unlimited plan. Why one month? It was cheaper than 7 one-day plans. Why one device? I have two (smart phone, netbook). One device actually means one device at a time (no multiple simultaneous logins). Note that you have to have a local HK phone number (not necessarily from PCCW) in order to buy the wi-fi plan. And how useful is the wi-fi service? They have wi-fi locations all over the city, including at some phone booths and in MTR stations (and in the Airport Express train, which is partly why I picked PCCW, so hey, good advertising move for them there). Note: of course there are several competing companies offering pay-as-you-go SIM cards; I’m ntot saying this is the best one, but it works for me. Korea, and Seoul in particular, is one of the most wired places on earth. Or should that be most wireless places on earth? Internet access is very fast (speedtest.net showed 30/10 Mbps down/up at my hostel, about 10 times the speed in North America). Many cafes, restaurants and bars have free wifi (though Starbucks does not). There is wi-fi across much of the city, though not free. I didn’t need it enough, but I think it was $2-3/day. Around town (and especially in metro stations), they have large touch screens with area information, including google satellite map of the area. Very cool. Surprisingly my GSM phone did roam in Seoul (and Tokyo airport), though I didn’t make calls. (Tip: if you call your phone from Skype in order to check voicemail, turn off your phone first or you may be hit with roaming fees; also, you might need to wait an hour for the phone to be unregistered from the roaming network). “Seoul Subway” Android app by Sungpil Jang (probably an IPhone version too) – way cool, even offline. Even offline (i.e. no data plan nor wi-fi connection), it will calculate a route between 2 stations including times of the next train(s), and tell you the car and door number for quickest transfer between lines (i.e. where the stairs/hallway to the next metro line is exactly). Adobe PDF reader for my downloaded Lonely Planet guidebook chapters. They were difficult to read on a small smart phone screen, but handy while out and about to double check something. Although the zoom function was weak – even with my good eyesight, the text wasn’t very big and the light blue markers/text for maps were darn near unreadable. Even reading the pdfs on my laptop was less comfortable than a physical book, but it beat carrying around a big guidebook (and if you’ve ever carried, say, the entire India guidebook, you know what I mean). Note: pdf reader was free; the Lonely Planet chapters were not. ASTRO file manager. Nice app for navigating my SD card, e.g. to find the pdfs (and put a shortcut on my home screen). WorldExplorer map program. In particular, I was able to cache portions of the Taipei map from google maps easily, to varying degrees of zoom, for use while walking around town. With a strong zoom, I could even see the building outlines just like on google maps website. Taipei Metro map program. Not indispensable, but it was nice to peek at the subway map from my seat, instead of having to get up and look at the map next to the train door. It shows both Chinese and pinyin names for each station. Note that the Taipei metro lines and stations do appear on google maps. Also note that they were in the process of renaming Danshui to Tamsui (which is notable because it’s the northern end station of the red line) to be a more accurate reflection of the name. So what about wi-ifi you ask? Taipei is quite wired. Both my hostel’s and one cafe around the corner had wi-fi with 3-6 Mbps down and at least 500 Kbps up. So skype worked well for calls back home. If you have a local Taiwan mobile phone, you can register to use the free wi-fi around the city (I noticed it in a few metro stations). If I had been there longer, I probably would have bought a prepaid SIM card for my unlocked quad-band GSM phone. As it was, I didn’t have any real need to call anywhere. 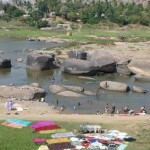 There was no night train from Hampi. I should have considered the night sleeper bus (apparently you get a sleepable bunk – not reclining seats). Then again, The Book says to avoid night buses. 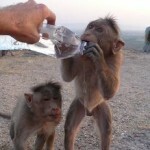 Then again, I’ve met plenty of travelers who like them.